His technician shrugged and threw a clog of wood into the stove. They were working from Mr Wolf’s house: a temporary arrangement. Their office in the city was cold and dark, because in the last few days gas and power in the city had become intermittent. Driving in and out to the office was a bad idea, too. Not that the roads were busy; in fact the city centre was quiet these days. There were miles of queuing lorries at standstill on the motorways, the quaysides lined with part-unloaded ships. Their cargoes were trapped in Customs while the politicians argued. Driving meant burning fuel that may not get replenished, so the interim government encouraged people to use the railway instead. However, a circuit board had blown inside the signal box where the tracks converge on Waverley, and several trains were stuck fast in the gullet. A replacement board had to come from Germany, but the urgently-needed package was stuck in Customs at Dover. The site had run out of plasterboard weeks ago, truckmixers wouldn’t deliver beyond the city boundary, and copper pipework was like gold dust. There was talk of building licences being re-introduced, just like during the 1940’s. So Mr Wolf turned back to the internet, which for the moment at least was still working, and tried to source some ironmongery. There was no point specifying familiar brands; factories were on a shutdown and stocks at the wholesalers had run out. After a couple of hours spent scouring the net and making fruitless phonecalls to ironmongers in little country towns, Mr Wolf struck lucky. He found an ancient business in the Black Country with old stock in its warehouse. A picture formed in his mind: dusty boxes massed in corners, on shelves, hung from hooks, piled on counters, set out on stands, stood up on the floor, and hidden away in stock rooms … all to be fetched out after a hunt. Mr Wolf did a quick calculation from metric back into the Imperial measures which the interim government had imposed a few weeks before, along with food rationing and blue passports. “Right then, I’ll take the lot.” Lately came the fear that if you didn’t snap things up when you had the chance, someone else would. So that was the door hinges sorted – but shortly afterwards the electricity went off. Then the internet. It was 4pm, so he decided to quit whilst ahead and go for food. As he sclytered though the snow, he could hear dull thuds resounding across the firth. Perhaps they were bird-scarers, or wildfowlers blasting ducks from the sky – only now for food rather than sport. Soon he reached the small supermarket at the foot of the brae, hoping to discover it had received a delivery that afternoon. An old man was tying his dog up outside the shop. “It’s no easy,” he shook his head, “I cannae even get his food down the Co-Op any mair.” They both looked down at his dog, a long-bodied basset with a morose expression. The dog looked up, sneezed and shook itself. Mr Wolf thought it did indeed look hungry, but they always do and besides the dog could do to lose a few pounds. When he got back from the shop with a giant bag of pasta, a wedge of stale cheese and a dented tin of pear quarters, the technician had packed up and was ready to leave. Mr Wolf nodded and waved him off, “We’ll need to carry on tomorrow and see if we can get some lever handles and pulls. “I don’t know, I really don’t.” Mr Wolf knew that things weren’t looking good – yet the folk protesting on the streets today and the angry hacks in the tabloids, had all been in favour until the reality struck them personally. Next day was cold and bright, so Mr Wolf decided to take his chances with the petrol and see if he could find more hardware. The client had agreed to keep paying fees provided Mr Wolf could lay his hands on materials. To do that, Mr Wolf had to use all his ingenuity. He fell back on old contacts, called in favours, and even searched in the baccy tin where he’d kept ten years’ worth of business cards, just in case this day should ever come. At the very bottom of the tin was Arturo Ross’s card. Half an hour later, Mr Wolf pulled his car up onto the unmade pavement in front of an old bleachworks. The whitewash was peeling from the brickwork, and a few windows had been smashed, but the gates were open and machinery was running faintly somewhere inside. Hi Arturo, how goes it? Arturo looked up from vat of noxious chemicals. He pulled out a length of metal which steamed and sparkled as it met the air. It was a two foot long pull handle. “What? You’re taking the piss. Anyway, I’m needing handles, bronze or something that looks like bronze. Ross ran the fifty pound notes under an ultra-violet lamp (you couldn’t be too careful these days) then added them to a roll held together with a fat elastic band. There was no pale blue or sepia brown, but Mr Wolf got the want of many leaves of purple and magenta. For months to come there was no let up in the cold weather: the city was dead and the ice showed no sign of melting. If you’re searching for a microcosm of Brexit Britain, you could do worse than begin by scrutinising the UK’s widget manufacturers. Over the past few weeks, I’ve scoured the wholesalers on Dryburgh industrial estate for well-designed electrical widgets, or “wiring accessories” as M&E engineers call them. As I hunted through trade outlets and online, my path crossed with some Buy British enthusiasts, who are on a mission to support the UK economy at this difficult time; shades of Al Murray’s Pub Landlord and his campaign to Save the Great British Pint… So this is a rumination on whether we make stuff any more, and if so, whether it’s any better than what we import. Buy British is sometimes overtaken by the imperative to Buy Scottish, but there are a few exceptions. You’d think that with two of the UK’s Big Six energy suppliers based here – Scottish Power is headquartered in Glasgow and Scottish & Southern Energy in Perth – there would be a thriving electrical components industry in Scotland? Sadly, no. Scottish firms concentrate on the heavy end of electrical engineering: Brand Rex at Glenrothes make cables, Belmos in Motherwell make distribution boards, Parsons-Peebles at Rosyth build electric motors, Bonar Long in Dundee used to make power transformers and Mitsubishi Electric at Livingston still makes air conditioning and heat pumps. However, we appear to have neglected the well-designed, good quality switchplate. “The door handle,” said Juhani Pallasmaa, “is the handshake of a building.” Presumably the light switch isn’t far behind. It’s another point of close contact, yet many switches are made from white moulded plastic, which looks cheap, feels cheap and isn’t made to last. Neither is there any thought given to its environmental impact – so we should listen to Dieter Rams, the German industrial designer about whom a documentary film was released recently. Rams was Braun’s chief designer from the late 1950’s to the mid 1990’s, and in that time he designed hundreds of products which we’d now call minimalist. He wasn’t a stylist, but approached each product ergonomically, so that it would be well made, long lasting and intuitive to use. Dieter Rams has been talking about the social, political and environmental impact of design for more than half a century – interestingly, the antithesis of the line taken by late Isi Metzstein, who complained that too much consideration is given to the social and operational aspects of design, as opposed to the architectonic. Many of the products Rams designed for Braun were made from injection-moulded plastic, which isn’t in the least environmentally-friendly. However, he and his contemporaries didn’t make disposable goods, they made things to last: lots of people have Braun products such as calculators, radios and kitchen gadgets which still work, 30 or more years after they were made. 30 years or more can’t be said for cheap light switches. It’s rarely worth trying to repair white moulded plastic faceplates when they break, and they can’t be recycled either. Similarly, manufacturing in the Far East then shipping components to Britain is madness, no matter how cheap it is today to stick things in a container. So, bearing in mind environmental impact as well as aesthetics and practicality, the following thoughts come from my experience as a specifier who insists on seeing and feeling samples, and also from listening to electricians and electrical engineers. Where to begin? I’m told that in the 1960’s, Crabtree accessories were robustly made, albeit rather old-fashioned and chunky in appearance. Then MK Electric produced a slimmer, sleeker style of faceplate which became more popular. However, sockets and switches from the 1970’s and earlier were made from ivory Bakelite, which is pretty much bulletproof, whereas the moulded urea-formaldehyde plastic used by everyone since then is easy to crack. Recently, a spark took me aside to ask why architects specify MK Logic Plus so frequently. He felt it must just be habit, because while MK Logic accessories used to be "Made in UK", MK was bought by Honeywell a few years ago, and some of its products are now "Made in Malaysia". Their website does say, “MK Electric, unusually for the sector, still manufactures its products for the UK in the UK; with a factory in St Asaph as well as Southend.” The electrician complained that he often had to return MK accessories to the wholesaler, because the fixing screws were jammed solid against the terminals, and he blamed that on manufacturing in the Far East. Perhaps that's just prejudice, though. Which makes would he recommend? Hager, Contactum, Schneider. Doing a bit of digging, “In the UK, Hager has a well-established R&D team and global resource to meet the needs of the market. This is backed up by the UK factory.” Contactum, “is one of a few remaining manufacturers of electrical wiring accessories and circuit protection products in the UK, and manufacturing still continues today at its factory in Cricklewood, London.” We'll come to Schneider later. The electrician reckoned that Telco, LAP and Knightsbridge were firms to avoid; according to him they are cheap and appear to be made abroad. So perhaps there is a correlation between where a thing is made and its quality. Is that economic nationalism, “common sense” as Al Murray’s Pub Landlord might put it, or pure prejudice? Many of us are cynical about the quality of imports – in other words, we believe that these things could be made much better than they are. Personally I used to reach for the MEM catalogue as my default for white accessories – MEM Premera faceplates appeared to be decent quality, looked slim, and a full range of accessories is available. MEM is now owned by Eaton, an American corporation, which shut down its factory in Oldham in 2005. But compared to white plastic, metal faceplates win every time. They’re not manufactured from petrochemicals, they won’t shatter like plastic does, they don’t turn yellow with age, and “live” finishes such as bronze will develop a patina with use, which we find attractive. Finally, if we’re finished with them the metal can be recycled rather than going to landfill or incineration. Metal faceplates got a bad rep in the 1980’s when there was an outbreak of Victorian Brass in suburban Britain. Once that subsided, polished chrome became popular, and now in theory you get a brass, bronze, chrome, stainless steel, nickel or copper finish, as well as powder-coated or clear polycarbonate “invisible” switchplates. Most of the major accessories firms offer several ranges in metal, and after some research I discovered that quite a few still manufacture them in the UK. But the best-designed products I’ve come across were made in Britain by GET Group. Their sockets and switches were presented in a box with a translucent sleeve which slid back from the carton to reveal a switchplate which followed the same design ethos as the keys on a MacBook’s keyboard. The plate’s corners were neatly radiused, the rocker edges were rounded off and their action was a well-damped clunk, rather than the nasty click-clack of a £2.50 switch. GET’s accessories were made from steel and brass and high density polymer, and even came with M3.5 screws in two different lengths, to suit different depths of backbox. That level of design thinking is rare, especially at the consumer end of the market. Electricians liked their robustness and the ease with which the terminals could be wired; I guess architects liked their aesthetic, bearing in mind that they were Mac-like, and of course Apple designer Jonathan Ive was heavily influenced by Dieter Rams … so ultimately the widget makers could learn from Rams' design approach and sustainable philosophy. GET Group plc was swallowed up by Schneider Electric of France a decade ago, and their clever designs have gradually disappeared, which is a great shame. It’s not clear from Schneider’s website whether they still manufacture in the UK, either. That adds to the feeling that well-known firms have been taken over by overseas companies, production moved offshore, and the quality may suffer while the brand trades on its past reputation. On the other hand, the contract quality fittings which architects specify for higher end projects are quite different to the budget quality you find in B&Q, Homebase et al., and the former are still made in the UK, if not Scotland. They might incorporate sophisticated electronic dimmers, or bespoke finishes which use metalworking skills developed by locksmiths and ironmongery hardware makers in the Black Country. The next issue of Urban Realm will include a few photos I took ten years ago in an abandoned building which has since been demolished. If you drove down the road today, you’d never know it existed, and that gives the images more meaning and greater power – or perhaps just an innate sense of melancholy for what’s now gone. I trained as an architect, so it goes without saying that I’m interested in buildings for their own sake; but shooting photos of abandoned places has also made me sensitive to the relationship between the man-made and the natural. That might be how industrial architecture such as a colliery or steelworks sits in the landscape, but also how nature takes back buildings, such as when ferns take root inside a derelict mill. Years ago I came across a book called “In Search of the Wild Asparagus” and that was one of the rare occasions I’ve come across an author describing an experience I can identify with exactly. In one chapter, the botantist Roy Lancaster rambles over the sand dunes at Ainsdale Beach, and that brought back my own trips to Tentsmuir Point and Buddon Ness, exploring the wartime bunkers and flotsam which the tide had brought in. In another chapter, Lancaster described how he explored wasteland and bombsites - then went on to discuss the rather commonplace plants he discovered there, such as fireweed, goldenrod and buddleia flourishing amongst piles of crumbling masonry and rusting pipework. Nature and the man-made exist in a two-way relationship which is closer to synergy than dichotomy: you can see exactly that when a plant takes root in a crumbly old wall, or mounds of moss choke up the rones. Roy Lancaster’s photos show the visual richness of old industrial sites being reclaimed by nature, and I’ve gone back many times to places like this, to root around for interesting objects and textures and juxtapositions to draw and photograph. As I’ve alluded to before, shooting photos of newly-completed buildings requires a different approach. Many contemporary buildings are visually sterile, lacking the rich textures and colours of decay, but also any sense of time passing and the history implicit in that. Of course, if you shoot photos of cocktail bars and nightclubs, they may have lots of colour, pattern and detail – but for the most part “maximalism” is unpopular in contemporary design. That leaves you with architectural photography as a study of materials, natural light and proportions and its poorest relation is the Grand Designs House, which is often very reductive and boils down to aspirational people who create the biggest volume they possibly can for the money, paint the interior white, then scatter a few pieces of furniture around. They use industrial cladding and reinforced concrete in the hope it will save them money (it rarely does) and the glazing often consists of huge single-aspect screens which provide great views, but blast the front of the space with uncontrolled light. Perhaps this sterility helps to explain the appeal of photobooks about abandoned places, but these books have their own hang-up. The authors are desperate to show us places which are “hidden”, “secret” or “unknown”. I wish them well, but in my experience very little is secret any more – the internet has put an end to that, and uninvited visitors with cameras tend to follow in each others’ footsteps. Besides, these mysterious places were someone’s home, workplace or church until a few years ago, and it takes a generation at least for people to forget them. Does pursuing your own version of an iconic photo devalue the photo that you take yourself? No, because it’s still your image and you got the chance to see the place with your own eyes. But it does devalue the intention behind it. The more somewhere is publicised on the net, the less secret it is, and if you chase these chimaeras, you risk becoming the thing which everybody hates – a tourist. The tourist looks at everything as a photo-opportunity (usually involving a selfie to post on Instagram); the architectural traveler looks at buildings as an opportunity to learn, perhaps from their detailing or materials choices. But I’m still interested in stepping outside the professional architect’s mindset – although I realise that after over 20 years it can never really be switched off – and trying to look at buildings as subject matter, something I can photograph or sketch/paint. Over the past year I’ve met up several times with a friend who shares my interest in decay and abandonment. Although we both studied at Duncan of Jordanstone, we followed different disciplines and after each trip I look forward to seeing her photos, because she sees the world in a markedly different way. As she said, it’s very obvious our photos were taken by different people. So far I’ve been surprised and puzzled at how different our subject matter, technique, processing and everything else is, considering we visited the same place at the same time, and watched each other working with the same “content”. Sometimes it’s difficult: although we have much in common it feels like we’re struggling to find a shared language. There is much room for misunderstanding, but we’ve shared a few things already and she’s begun to help me see things differently. Following on from my piece in the Autumn ’18 print edition of Urban Realm about Glasgow School of Art, I thought I would expand on one aspect by trying to separate the so-called “Mackintosh Style” from Mackintosh the designer. As you'll see, that phrase is a misnomer. Some people read widely and travel in order to soak up influences. Others purposely avoid looking at what their peers produce: they’d prefer that their own work isn’t influenced by anything outside themselves. It’s a similar notion to authors who avoid reading other peoples’ books whilst in the process of writing their own. They claim that’s the only way to create work which is truly original. Chasing that chimaera is a strange and perverse pursuit. Firstly, it’s impossible to avoid other peoples’ architecture, whether reproduced in magazines and at the hands of Kevin McCloud on Channel 4, or in a more concrete form that we walk past every day. Another issue is that unless you’re a genius or idiot savant, creating something that’s completely original is almost impossible. Every tectonic combination has been tried before; we’ve had several thousand years of practice. Even if you’re lucky enough to have that idea, what do you do when others take inspiration from you, and try to emulate your originality? If you work in isolation, maybe that doesn’t matter. You won’t be aware of your imitators, so you’ll continue refining your original concept – despite the fact that your work no longer looks fresh, and might even be seen (ironically) as a poor pastiche of your imitators. You’d be forgiven for thinking that’s the position Mackintosh ended up in after his death. Following the revival of interest in his work during the 1960’s and 70’s, there was a bad outbreak of “Mockintosh” during the 1980’s. After working the summer holiday after I left school, for an old-established Scots practice with a portfolio of what you might call modern Scots baronial buildings (of which I was totally ignorant at the time), I graduated and went to a more contemporary practice in the city. Three of their completed buildings stood out for me, although they’re not the best known in their portfolio. One was an office building on a science park, but rather than a low-slung steel-and-glass pavilion, this had a sandstone rubble core which read from exterior to interior, and inside it various screens and balustrades which picked up on the Mackintosh grid. It was a modern reinterpretation of the forms, proportions and materials Mackintosh used. The second was a bank branch in a provincial town which was highly-detailed to the verge of being over-worked. It had one eye-catching feature: a glazed corner which opened up to reveal a clock face set into a Mackintosh grid, very much Derngate circa 1916. That was an intricate piece where shopfitting met furniture design, and thirty years later the bank which commissioned it is better known for closing branches than doing up their interiors. The third was a private house built in the grounds of a large mansion in the suburbs, and it was a play on the crowstep, with stepped gables, a stepped section with scissors stairs, and endless grids inside which broke down into stepped shelves and screens. From certain angles, it appeared to have lifted pieces of Mackintosh buildings, such as the Hill House, and collaged them together. Were these three buildings modern interpretation, Mackintosh-inspired homages, or just plain pastiche? All three owed much to Mackintosh in an obvious way because his motifs were so prominent, when compared to my summer holiday practice which integrated historic Scottish architecture in a more abstract way. The latter used modern techniques such as reinforced concrete frames and patent glazing, alongside more traditional timber boarding and rubble cladding, in order to create a sense of materiality. Even though we’ve long since left behind the Victorian Battle of the Styles, architecture and the other arts are often judged on appearance, rather than intent or execution. Yet artists draw inspiration from sources outside their own art: Expressionism grew from the work of psychologists such as Freud and Jung; the work of philosophers, sociologists and cosmologists was drawn into the architecture of Rem Koolhaas and Bernard Tschumi, for example. The key thing is to acknowledge those influences. That’s why recent scholars have questioned the claim of the author Thomas Howarth that Mackintosh fell to earth fully-formed, bearing a new architecture in his lap. We know Mackintosh was inspired by many things – for example, he won the Alexander (Greek) Thomson travelling scholarship and filled sketchbooks during his European journey. Also, Mackintosh does have one acknowledged influence in Scotland: James Maclaren, who designed the village of Fortingall in Perthshire and more besides. It could be argued that James Maclaren developed the “Mackintosh Style”, by which I mean the stylised Scots baronial later applied to Windyhill, the Hill House and other domestic commissions. Maclaren also influenced Robert Lorimer, who was his pupil for a time. There’s nothing wrong with studying the work of people you admire and learning from it. Be proud of your influences, because equally there’s no shame in acknowledging those on whose shoulders we stand – just as Mackintosh stood on James Maclaren’s. "Skägget i brevlådan – Don’t get caught with your beard in the letterbox," is a Swedish idiom which means that there's work to do, but you're not doing it, and someone catches you red-handed. Hence you're caught with your beard in the letterbox, which is similar to being caught with your pants down - much as when the Three Stooges attempt to get through a doorway simultaneously and all three get stuck as a result. When I take photos of buildings, I sometimes feel that if I did have a beard, it would be in danger of getting it caught up. I’m largely self-taught as a photographer, although I got one or two tutorials when I started at architectural school, but I’m interested in how others have developed their photography in a deliberate systematic way, for example using wide angle lenses to make punchy photos from dynamic viewpoints. By contrast I’ve been haphazard in some respects, trying different techniques with different camera systems and photographic media, although by accident or design I’ve tended towards the “record photos” approach: usually in colour, not too high contrast as I’m trying to pull out as much detail as possible, and almost always with “correct” or parallel verticals. I suppose that’s not a surprise, as I’ve consumed books by architectural photographers like Ezra Stoller. Yet sometimes I feel the need to rebel creatively, and a few months ago I booked myself onto a pinhole camera workshop - partly to try something new, but also because the artist presenting it spoke about her approach being a bit scattergun when she was at art college, trying everything once, whereas in time as an artist/ photographer she realised you have to develop a way of working, out of which a style or approach generates itself. That balance between systematic/ thematic and creative/ spontaneous thinking is something I’ve come back to quite often. Of course, there’s no “right” answer, but I used to consider that the creative choices were solely based on subject matter and composition, whereas the rest seemed simple when I shot film, as Agfa RSX gave me colours and tones which I really liked, with no effort at all and mp need to post-process. I find myself trying to emulate that aesthetic with digital, but while you can sharpen digital files that’s not quite the same as acutance rendered on film, likewise RSX gives you “neutral” colour rendition but it seems there’s more to that than just manipulating colour temperature on a RAW file. Or is it perhaps just that I’m old enough to have learned to shoot photos on a SLR with transparency film, and that sticks with you, just like the taste in music you develop in your late teens or early twenties stays with you through life. So it is that these photos were shot on slide film in the city of Malmo, a Swedish city whose tallest building is the Turning Torso, which was built by Santiago Calatrava a few years ago. Well you learn something every day, as the old cliché goes. As I was browsing, I came across the concept of the ideation room. Ideation appears to be a recently-coined portmanteau word, from “idea” and “creation”. Ideation might well become the next hackneyed term in workspace design, joining touchdown desks, break-out areas and co-working spaces in the parlance of workplace designers and space planners. This particular ideation room is located in a grimy old brick-built block in the East End of Glasgow, not too far from Urban Realm’s offices. The building originally housed one of the biggest hand tool firms in Glasgow – which eventually became one of the last toolmaking firms in Glasgow. I wrote about another, William Cook & Sons, in Archive magazine a few years ago and have since collected lots of material about the Scottish Machine Tool Corporation which built tools at the other end of the size and complexity scale. Sheffield is the best known British centre for tool manufacture, but Glasgow had many hand and machine tool firms at one time. They’re far less well known. The toolmaker’s factory churned out well-understood tools whose purposes and forms were fixed during the Victorian era, and were little changed in the first half of the 20th century. Workplace consultants on the other hand, are fairly desperate to find novel forms in which to wrap up everyday functions. The high-sided upholstered booth is one; an overgrown couch which is usually wired with USB points so that the hipsters can charge their iPhones. The boardroom table with grossly over-sized pendant lamps is another; pale spirits of the giant Artemide anglepoise lamps which you still occasionally see in interiors magazines. Both sit against a context of the bare brick and raw concrete which emphasise the arte povera aspirations of a particular kind of industrial conversion. The novelty forms are just an adjunct to the pieces of jargon and time-worn phrases such as “Front and centre”, “Low-hanging fruit” and “Blue sky thinking” which some workplace consultants employ, yet no-one should use in a meeting or write in a report, far less mention in a magazine article. They’re examples of lazy articulation, phrases which have lost their original sense through overuse, and as George Orwell observed, clichés like these result in "phrases tacked together like the sections of a prefabricated henhouse." As it turns out, ideation is just a new word for brainstorming – but perhaps with a little more brainstorming, the workplace planners could have coined a better name for it. Meantime, 21st century rag-and-bone men masquerading as antique dealers are selling off the framed displays of tools which used to showcase the firm’s products as you came into the building. What a shame that, despite the yearning for “authenticity” and a superficial attachment to the hand-made and artisan, the class of people who use the building now have discarded the very last artefacts which say anything about its roots. When I went for a walk over Ark Hill in the Sidlaws a few weeks ago, I realised that wind power is sometimes the stuff of hot air: tabloid headlines, emotive soundbites, kneejerk reactions. One way to set it into context is to explore the considerable back story of renewable energy in Scotland. It always takes something to spark a child’s imagination in a subject, and in my case it was the discovery that my grandfather’s cousin, Douglas Neilands, was secretary to the North of Scotland Hydro Board in its glory days, before it became SSE. The Hydro was created in 1943 by an act of Churchill’s wartime coalition government. It was driven by Tom Johnston, whose name is largely forgotten today, but his efforts to modernise Scotland stemmed from strong social convictions. Johnston was a socialist, a great patriot, and acknowledged to be the greatest Scottish Secretary of the century. Like Winston Churchill, he represented Dundee in Parliament: one of a long line of history makers such as Ned Scrymgeour and Gordon Wilson who also took their seat here on the banks of the Tay. You may not realise it, but Churchill arranged his trysts at an unmarked house in Laurel Bank. The aim of the Hydro Board was to provide electricity for all in the northern half of Scotland, and its creation anticipated a great reconstruction effort after the war, and began forward planning on the great hydro-electric power schemes at Loch Sloy, Loch Tummel and many others. As a by-product, the Hydro Board commissioned some truly Scottish architecture, from the austere Edwardian neo-classical of Tarbolton, to the modern baronial of Shearer & Annand, and finally the Scots Modernism of RMJM. The hydro schemes they built are still generating power 60 years on – and more importantly, supporting jobs, providing renewable energy, and preventing floods downstream of their dams. As with wind farms today, there was political opposition from several sides: the gentry were opposed to Hydro schemes as they impinged on grouse moors, and the far right were ideologically opposed to the socialist notion of public utilities. Ironically, opposition also came from the earliest throes of the environmental movement. Yet hydro power used existing watercourses to feed reservoirs which were often no more than existing lochs whose levels were raised. It begs the question, is there an “ideal” source of power? Nuclear is hugely expensive and potentially dangerous when things go wrong; however, it doesn’t create CO2. Coal is polluting and carbon-intensive – unless elaborate flue gas scrubbing and carbon capture equipment is fitted. Oil is equally bad, perhaps worse, and the raw material is more expensive than coal. Natural gas is cleaner, and more plentiful for the moment, but isn’t renewable and will eventually run out. Of the renewables, wind marks the landscape with turbines and isn’t reliable enough to use as base-load. Solar photovoltaics are hugely expensive, and perhaps better suited to countries closer to the equator where the sun is stronger. Wave power was pioneered in Scotland, but remains in the early stages of commercialisation and certainly isn’t invisible. Biomass energy is renewable, and waste incinerators seem like a good way to get rid of rubbish while generating “free” heat and power, yet worries remain over the pollution they can create and of course they still generate CO2. The cleanest and most renewable power source of all is nuclear fusion: but the physics required to make it work lie beyond our reach, and a fusion-powered generating station would cost tens of billions of pounds to construct. Choose your power source carefully, and bear in mind that government subsidies are fugitive things, and politicians develop great enthusiasms which are quickly dropped. The people who draw up those policies are lonely re-arrangers of things and anxious malcontents. A few years ago, an interesting short TV series called The Trap ran on BBC2. The Trap discussed the theories of Freidrich von Hayek, principally that folk act out of self-interest, and that to create social order, you have to rely on their competing selfish impulses being balanced out. That idea was applied during the Cold War (by the Rand Corporation), to create the nuclear "Balance of Terror" through mutually-assured destruction. The Trap's thesis is that the same principle was then applied to the NHS by the Thatcher government in the 1980's. Thus we have the "internal market", which spawned PFI hospitals ... and where from there? Perhaps Global Warming will be the next application of von Hayek's theory. It's certainly true that in the pursuit of freedom (freedom of choice in where to live, and freedom to drive and fly where we will) we're being constrained or trapped both by Climate Change, and the measures to tackle Climate Change. Over a decade ago, the Government announced it would force us to cut carbon consumption by 60%, reducing carbon emissions to the same level as in the 1870's and Government policies in the past twenty years such as the fuel duty escalator, carbon taxes, road pricing and carbon-neutral buildings have largely positive benefits. Most measures to combat Climate Change aren't retrogressive: using public transport, finding alternatives to coal and oil, reducing pollution of various sorts, making buildings and vehicles more energy efficient are worthwhile in themselves – but conspiracy theorists will separately argue that the West is using Climate Change as a means to check the economic power of China and India. Von Hayek would make the point that someone else always benefits, even as our energy costs increase: for example, the Seven Sisters (oil majors) are using Climate Change as a means to corner government funding for research into alternatives to oil, when they're quite capable of developing alternatives themselves. Another alternative was the Hydro Board’s own development programme, which ended in the 1970’s: Foyers was the last pumped-storage scheme, and Craigroyston on Loch Lomond was later shelved. 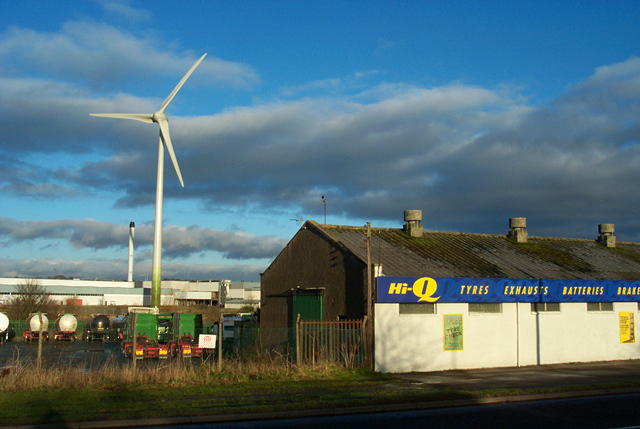 However, NoSHEB also pioneered wind turbines, working with the Howden company and eventually building a prototype of today’s monster turbines, at Burgar Hill in Orkney. While 3 or 4MW turbines are over 100 metres tall, many turbines in the countryside are only 20 or 30m, no more than the height of trees in the shelter belts planted around farm steadings. They’re not particularly powerful nor intrusive, and they follow a century-long tradition of harnessing the wind: “Climax” water pumps, which raised water from boreholes for irrigation, then in the 1930’s, Lucas “Freelite” windmill dynamos, which provided a 12 volt supply before farms had mains electricity. 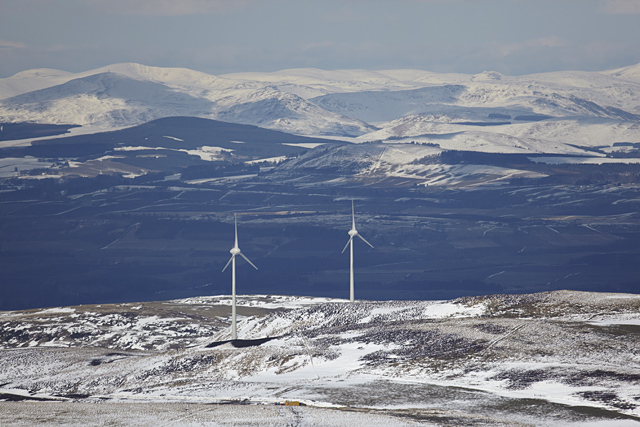 So, to come back to the Sidlaw Hills, the turbines on Ark Hill aren’t the largest in Angus: they’re smaller than those built at Michelin in Dundee, and little more than half the height of those proposed in Glen Isla, fourteen 135m turbines at Cormaud and eighteen 135m turbines at Macritch Hill, both close to the Backwater Reservoir. The Michelin wind turbines are actually a positive feature on the skyline telling you that industry is working here, just like chimneys or cranes used to be signifiers. In fact, if you stand on Craigowl you can see both the Michelin and Ark Hill, and it’s worth making that contrast. In the early days of economic forestry, Sitka plantations were set out with hard, geometric edges but now, they follow the natural contours and lie of the land and sit much more happily. Similarly, we need to site the turbines more intelligently, retaining a sense of wilderness and countryside. It’s a good idea to keep wind turbines away from houses, airfields, nature reserves and wild places. 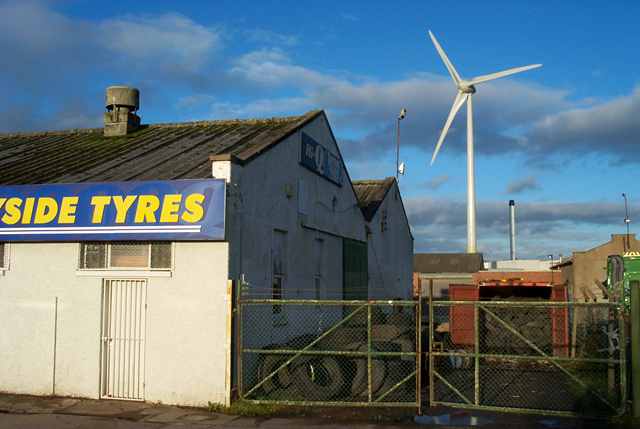 It also makes sense to build them close to where the power is needed, or out at sea in arrays where they can achieve a greater power density – so perhaps the turbines at Michelin are urban pioneers. This is a brief post about an old flour mill in France which looks like a Flemish palace, and about a far older book … a book so old that it’s close to being classed as incunabula, which sadly puts it far beyond the reach of most folk who’re interested in old architectural books. A few years ago, I stayed overnight in Lille and went out in the evening to have a poke around the neighbourhood. I was aware of the husk of the Grand Moulins de Paris mill, in the Marquette-Lez-Lille commune (despite its name, it’s nowhere near Paris). It was late in the year and evening had fallen quickly, but the ruined buildings were still clearly visible behind a barricade of precast concrete panels. It was far from pitch dark: the glow of Lille was a dull orange which extended almost to the zenith. And the place seemed to breathe in the dark, the wild shrubs swayed and whipped in the breeze. 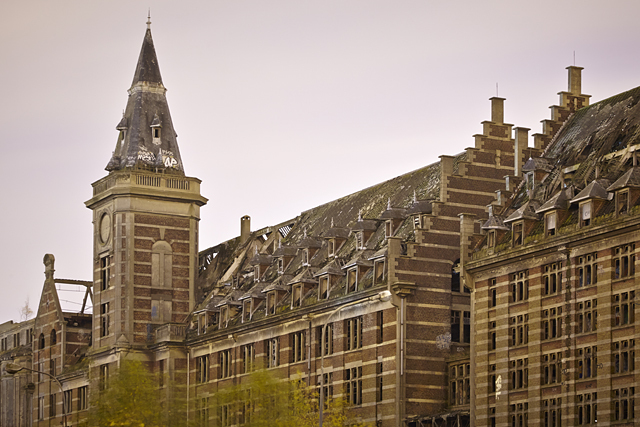 The building loomed up vast and louring in its wilderness. There were no day trippers, no chattering troupes of hipsters with cameras. Some might have a feeling of unease here, and the strangeness of it might frighten a casual passer-by. And why not? For this is one of the last remaining members of a dying race. 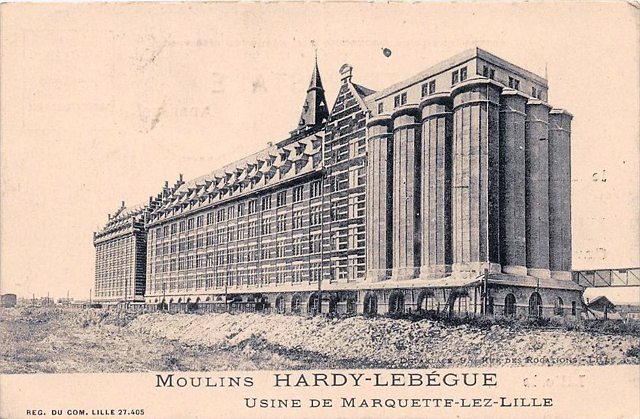 Several millers from Lille joined forces after the Great War, and this imposing 25,000 m² mill was the result. 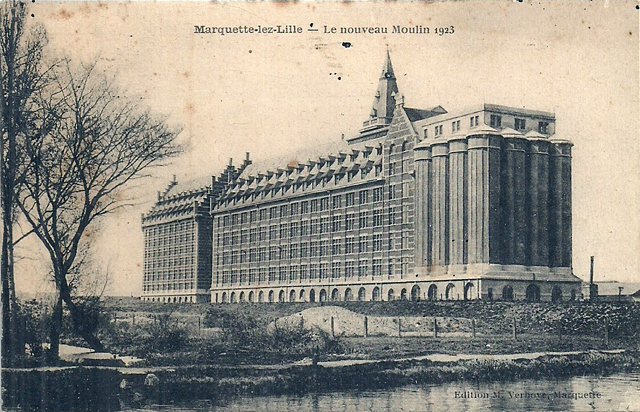 Designed by the architect Vuagnaux in a neo-Flemish style and built between 1920 and 1923, it opened as Les Moulins Hardy-Lebégue and ground over 600 tons of wheat per day, against 1,000 tonnes in the Grands Moulins de Paris, a competitor which bought it over in 1928. Like the Victorians, the Edwardians were addicted to architectural ambition, and they applied a style to a function in order to make industrial processes impressive. Later, the Modern Movement drove the development of reinforced concrete industrial buildings, stripping away any concessions to grandeur. Most of these old mills have been overtaken by progress, and only a few remain as a memory of what the industrial world once was. The collapse of the flour market in the early 1980s, with the arrival of a new tariff policy in the United States (sounds familiar?) had serious consequences for Les Grands Moulins de Paris. Flour milling ceased in 1989 and the last 57 employees were laid off. Then the building became a spectacular shell which looms above the Canal de la Deûle. 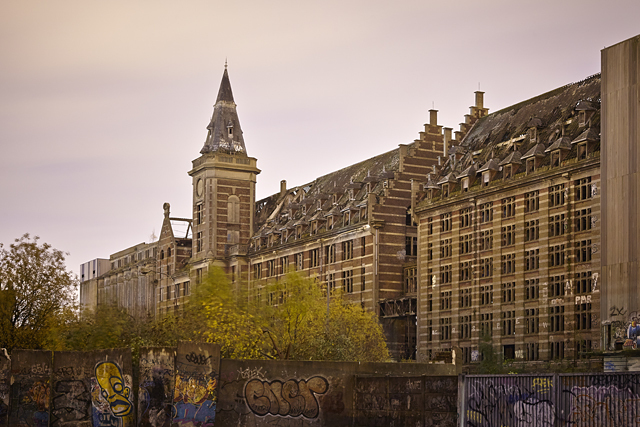 The site was bought in 1995 by SCI Diane de la Provenchère, and sold on a couple of times but a huge fire gutted the main building in 2001 and it sat derelict and ignored for the next decade. Meantime the mill, with a façade 140 metres long and a belfry tower 40 metres high, was listed in the Inventory of Historical Monuments in May 2001. That didn’t really help; the scheme’s complexity and disputes with the site’s owner held up progress. The building lies at the heart of a regeneration masterplan of 65 hectares called the "Rhodia Enlarged Site" which includes the Bouverne industrial zone, the Marquette Archaeological Park, the Rhodia site at Saint-André. But the proximity of the former Rhodia chemical plant, and arguments about the costs of remediation (the mill’s basements were contaminated with pyralene which spilled from electrical transformers following a copper theft) complicated matters. 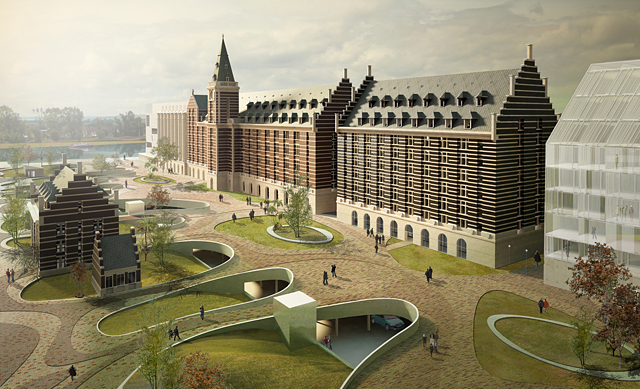 Marquette’s mayor Jean Delebarre promoted a new scheme in 2012, designed by Lille architect Hubert Maes. That included loft apartments, restaurants, a hotel and underground parking. Disagreements about the bill for remediation, building permits and other planning issues carried on in the background. Financière Vauban bought an option on the site in 2014, but the building permit was only applied for in November ‘17, after which they finally took possession and installed security guards. In all, between 400 and 500 apartments and houses are planned, with around 250 units in the historical part, 95 in a building next door plus some newbuild housing. 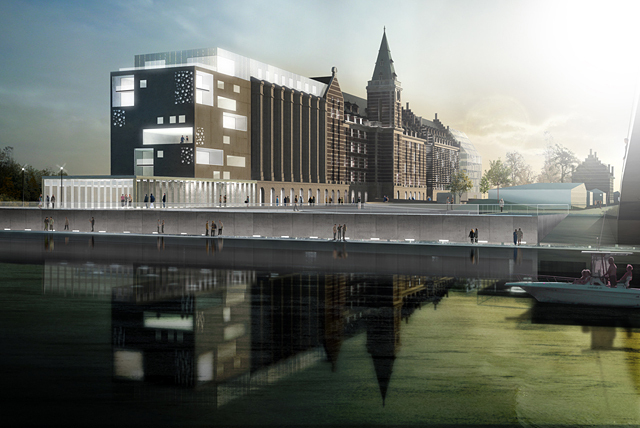 The concrete silos will be retained, and a triplex apartment with "a view to Belgium", will be created in the campanile. On the ground floor at the foot of the silo will be a parade of shops, a nursery, offices… so it’s a mixed use scheme in the tradition of 21st century development across Europe. 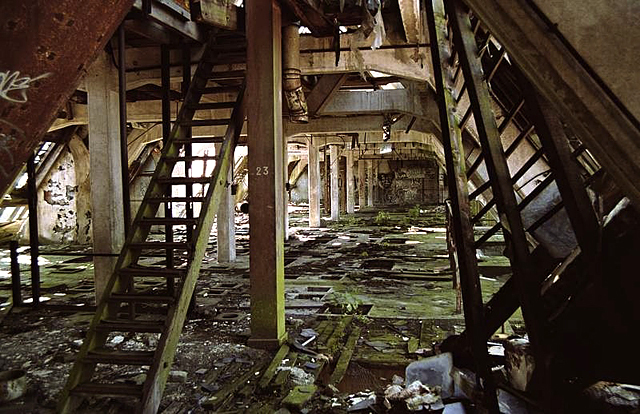 Despite its ruinous appearance, the building’s frame is still in good condition, since it consists of massive reinforced concrete columns and beams which carried the heavy milling machinery. All that concrete was hidden behind the decorative brickwork, of course. A sign on the fence said “Peril Imminent” and this is quoted for truth; if you went inside you’d discover enormous holes in the floors, and ten storey high stairwells without their balustrades. So what prompted me to write about Les Grands Moulins, several years later? I came across a four hundred year old book called “Des Fortifications et Artifices, Architecture et Perspective”, written by Jacques Perret de Chambery, who was engineer and architect to Henri IV. The engraved title page depicts a classical portal crowned by an equestrian portrait of Henri; at the foot of the title page is a bird's eye view of the city of Paris and the legend: "Par le grand Roy Henri IIII. Le vingt deuxieme de Mars 1594." Perret’s imaginary fortifications and city plans from over four centuries ago must make this the very first book of “visionary” architecture. A French architectural historian wrote that Perret’s baroque tower block, a 12-storey tower complete with rooftop sculptures, urns and fountains, prefigures the modern urban skyscraper. This folio also includes a series of models for cities and citadels with geometrical designs, mostly drawn from a bird’s eye perspective.